By 2048, we're on pace to have a $99 trillion federal debt that exceeds 150% of the nation’s GDP. As a share of the economy, federal spending will be close to 30% and annual deficits will approach 10%. Can you balance the budget and save us from the debt crisis? Get ready to make some hard trade-offs. The America Off Balance calculator gives you control over the federal budget. See how particular budget or economic changes affect future debt levels and how general changes to spending or revenue alter the fiscal landscape. You now have control over the budget in ways never tried before. Alter economic assumptions, change annual spending, enact hundreds of different budget policies, or change how programs will grow. The platform encourages a much-needed conversation about our budget problems and potential solutions. The calculator allows you to save and share their budgets. 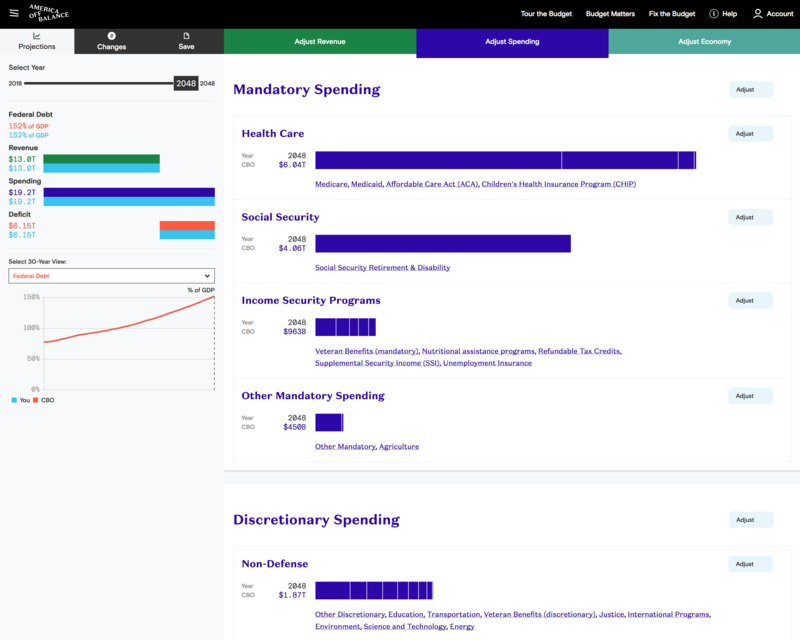 This makes it an ideal tool for policymakers, journalists, and policy advocates who wish to advance their own budget ideas with the larger public. CLICK ON THE IMAGE BELOW TO START FIXING THE BUDGET.